December was a tough month for the fine wine trade. Signs were starting to point in the right direction and most economists and financial analysts became more optimistic on the Euro surviving. However, there was still too much macro-economic uncertainty for collectors or the trade, to have the confidence to take meaningful positions. With the festive season coming up and most investable wines falling in price, buyers were happy to keep their powder dry. The first week of January is markedly different. In fact, our first 5 trading days in January have generated as much turnover as the whole month of December, with sales equally divided between UK and Asian customers. Importantly, more than half of sales were Bordeaux 1st Growths, indicating that there is a growing sense that 1st Growths (still the engine of the fine wine trade) are reaching the point where they are considered worth buying again. Encouraging signs indeed. There are bargains (relatively speaking that is) to be had. As an example, Latour 2003. This is one of only 10 First Growths post (and including) 1982, that Robert Parker has rewarded with a perfect score of 100 points. After a drop of 24% since its peak in July 2011, it’s now available at £7,800, which is the same price as it was three and a half years ago. This is not a fad or high risk wine. This is a classic, iconic Bordeaux 1st Growth, from a chateau that releases notoriously few cases onto the market. 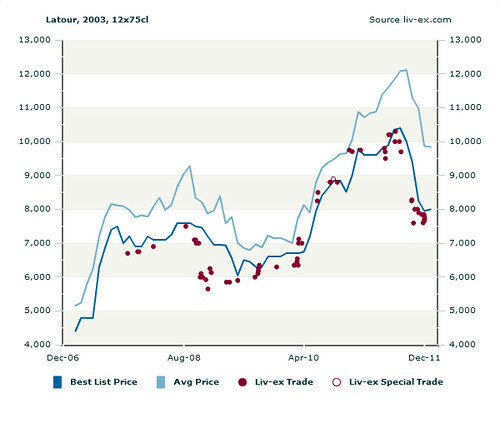 You have to go all the way back to 1982 to find another 100-pointer Latour (trading at £16,000). It’s like 1 Hyde Park coming onto the market at a massively discounted price because the oligarchs are having a temporary cold. Mind, I don’t want to plug this wine, I merely want to point out that – in the longer run – this cannot be a bad buy, IMHO. This week also sees 2 new wine investment vehicles being launched in the UK, both benefitting from the generous (personal) tax relief that the UK’s Enterprise Investment Scheme (EIS) offers. Anpero Capital has started to raise £2m to be invested into an EIS qualified fine wine trading fund, whilst Ingenious’ Vindemia 2 fund has started to raise between £4 and £10m. The latter is to be invested into start up wine trading companies, and comes on the back of Vindemia 1, which was successfully launched in February 2011 and is now in full operation. If you want to know more about the potential benefits of the EIS scheme in relation to fine wine investment, do get in touch (it’s far too technical to discuss here). As a final thought, the Liv-ex 50 this last week almost entirely clawed back the rather big drop it suffered in the last (illiquid) trading week of 2011. Is this down to last minute orders from China, hurrying to source in time for the Chinese New Year at the end of January, or is it a sign of things to come? Undoubtedly, we’ll know more next week, when what seems the whole wine world is done with tasting the 2010 Burgundies.